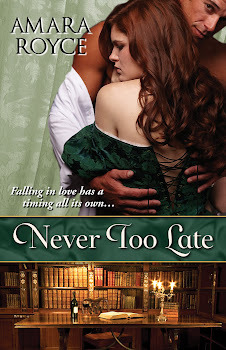 Never Too Late is available for pre-order on Amazon! I hear it's also available for pre-order on iBooks. Is it wrong to adore your own book's cover? Because I do. I really, really do. I especially love that the artist included the bookshelves below the title bar. It's perhaps a bit surprising how often the hero and heroine find themselves in intense moments when surrounded by books. I'll be sure to post links on the Books page when Never Too Late becomes available at other ebook retailers. As you may have noticed, I've added a new tab to the navigation bar above: Appearances! April 6 - I'm doing a guest spot at A Little Bit Tart, A Little Bit Sweet. If you don't know blogger/reviewer Limecello, you should! May 3 - I'm doing an interview at Ella Quinn's blog. Ella is a fellow eKensington author with books due out this fall. She also happens to be a Forumite (see my blog post about online writing communities)! More dates will be added to the Appearances list as they become available. And if you're interested in having me do a guest spot on your blog or site, please use the Contact tab above to get in touch with me. Page Proofs...What a beautiful sight! 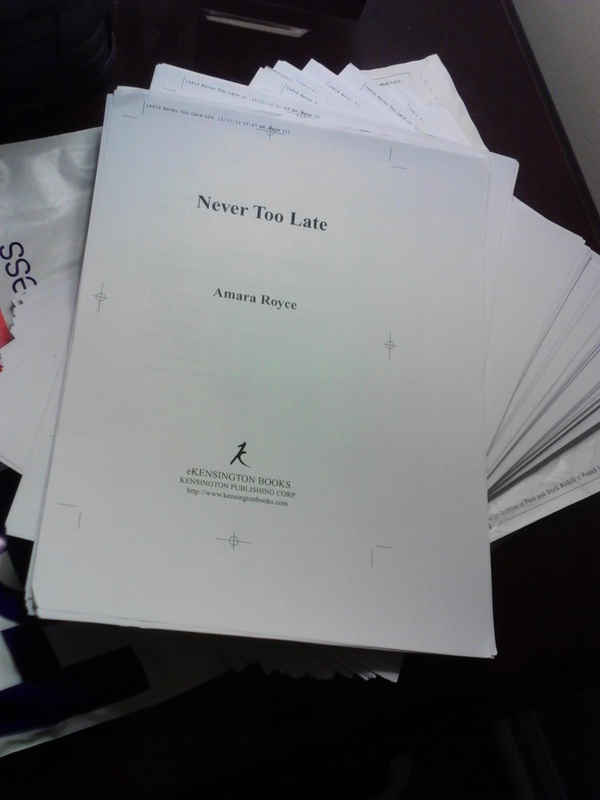 Page proofs for NEVER TOO LATE! Given that Never Too Late will be released as an ebook (at least initially...with the possibility of print sometime down the road), these hard-copy page proofs are especially delightful to behold! So what are page proofs? After a manuscript has gone through editing (usually both developmental editing for content and copy editing for accuracy and consistency), it is presumably ready to be made into an actual book. So it goes into the production process where it is typeset and formatted for publication. Basically, it is made into the pages that will eventually be bound and sold. So my little manuscript now has a title page (omg--it has a TITLE PAGE!) and a copyright page (omg--it has a COPYRIGHT PAGE! I will have something copyrighted! By a publisher!!) and all that lovely stuff that you see in *gasp* published books. And the text is formatted so prettily. There are honest-to-goodness chapters...with the first letter of the text enlarged at the beginning of each chapter. There are headers, as well as typeset pagination (turns out my book is 220 pages long--including a few blanks, like the back of the Dedication page). Yet another completely surreal moment in this publishing journey. So what do I have to do with these page proofs? Well, here's the fun part. I need to go through each page with a careful eye, looking for any surface errors: stray punctuation, misspellings, repeated words, etc. I'm past the editing stage--so I couldn't make changes to content even if I wanted to. As I regularly tell my students, proofreading requires a different mindset than drafting or editing. Drafting is very exploratory. Developmental editing combines critical and creative thinking. Copyediting requires more careful attention to fine details and consistency. Proofreading, at least to my mind, requires authorial detachment from the text--it's all about the correctness of the words on the page. Yes, the words should make sense...and there's a problem if they don't. But it's not a time for me to wonder about the characterization of the hero or the wording of a letter the heroine receives. It's about whether each page is "clean." There are several tips for proofreading effectively, especially since it can be so easy to slip into just scanning and to gloss over so much that you've already read a thousand times before. I take a blank page or ruler and cover everything that comes after the line I'm reading. This keeps my attention on each word and each line. It's not "natural" to read this way, but I think it's an important practice. In case you're interested, here's more on proofreading (from Wiley), including a link to standard proofreading marks. I've set a goal of proofing 30 pages/day to get done ahead of my deadline with plenty of time to send the corrected pages back to my production editor (omg--I have a production editor!!! ).